Home Baked Lemon Pistachio Muffins are quick and easy to make. 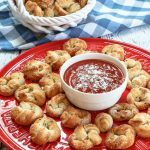 They are perfect for breakfast or with soup or salad at lunch or dinner. I’ve been on a serious homemade muffin kick lately. It’s no secret that I love making easy muffin recipes. One of the recipes that has just blown up the blog this year is my Homemade Basic Muffin Recipe. 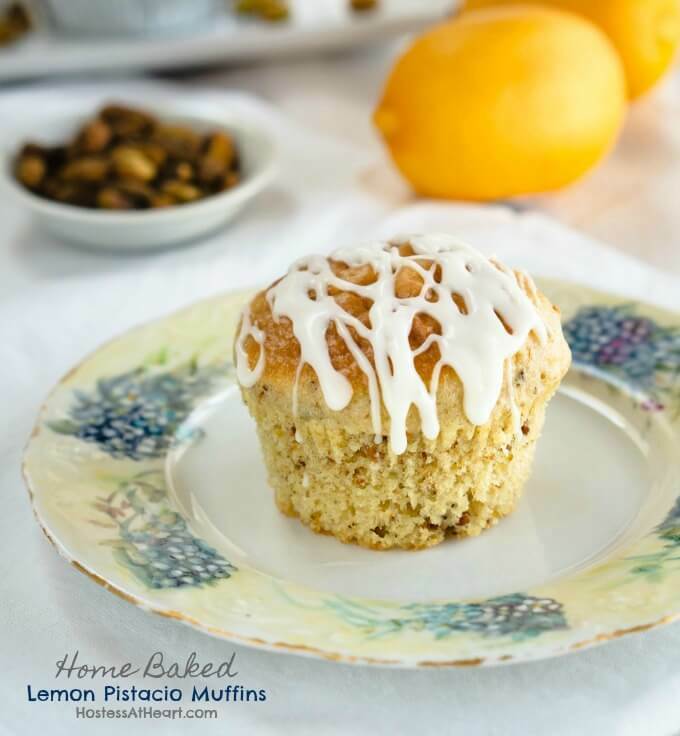 This Lemon Pistachio muffin is just as amazing! It seems like winter will never end. We’ve had 7 weeks of snow in a row and now it’s raining! Weather like that just makes me want to bake. Does it do that to you? What do you do to stay sane with weather like this? Lemon just brightens anything up, including me! 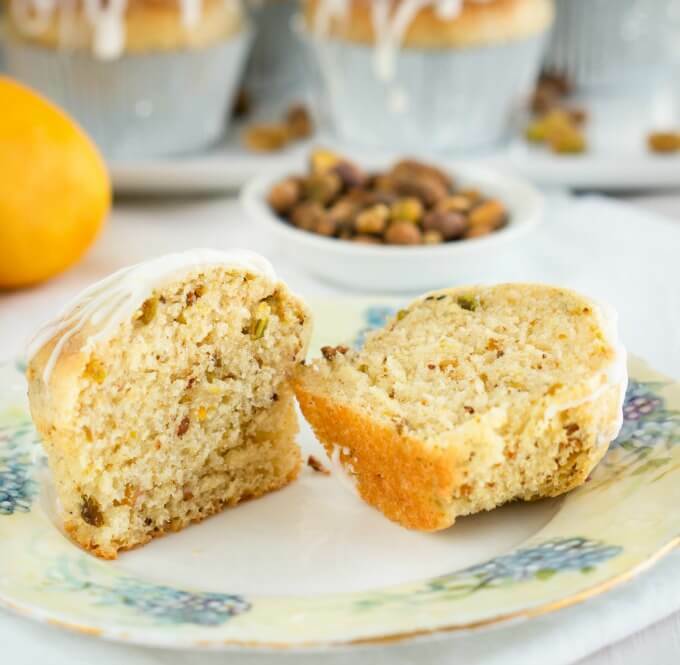 I especially like baked goods with lemon flavors such as these simple lemon muffins with glaze and pistachios! It reminds me of spring so I thought it was fitting when I decided we needed a new easy muffins recipe to go with the Thick Cheesy Baked Potato Soup that I made. Oh, the combination was GLORIOUS! 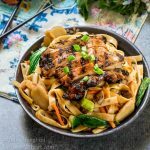 I totally understand how busy you are so if you don’t have time for my helpful tips and delicious recipe ideas, just scroll to the bottom of the page where you can find the printable recipe card. Making homemade muffins from scratch isn’t difficult. If you think about it, store-bought muffin mixes are just the dry ingredients and YOU add the wet ingredients such as egg, milk, oil, and extracts. You are buying very basic ingredients that you may already have on-hand such as flour, sugar, salt and a leavener (baking soda and baking powder). I’m all for convenience so use what is right for you. What is the best kind of flour to use to make muffins? All-purpose flour is perfectly fine for muffin recipes. The impact of the kind of flour that you use in some finer desserts or sturdier bread recipes is more measurable. It’s based on the protein content. The higher the protein content, the sturdier or stronger the flour. There are several references for explaining the differences in flour such as Fine Cooking. If you liked these easy muffins, leave me a comment and a 5-star rating! Here are a few more recipes that I think you will like. 12-cup Non-stick muffin pan – I love these muffin pans and have three of them so I can get them all filled and baked at once. They’re great for egg cups too! Mini-Prep Food Processor – This little genius is a work-horse in my kitchen. I love that I don’t have to drag my big heavy one out when I want to chop nuts or veggies. 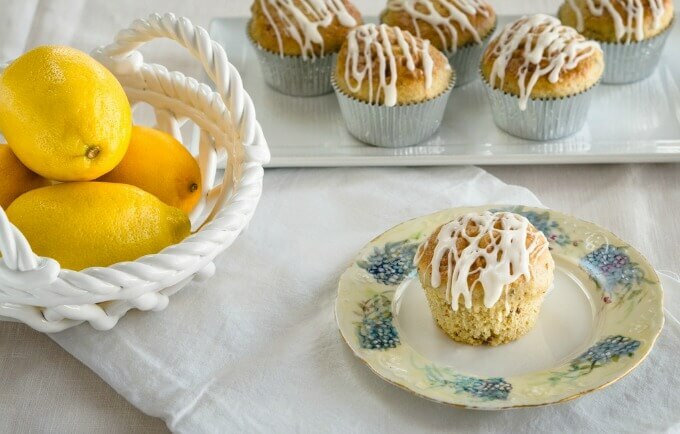 Home Baked Lemon Pistachio Muffins have a soft and tender crumb and are drizzled with a sweet lemon drizzle are perfect for breakfast or with a cup of soup at lunch and dinner. Preheat oven to 350°F. Grease or line 2 12-cup muffin tins with oil, butter, or a non-stick cooking spray or insert cupcake liners. Combine milk and the juice from one lemon together and set aside. This will become buttermilk after about 5 minutes. In a large bowl combine flour, baking powder, baking soda, and salt. Whisk together and set aside. In the bowl of an electric stand mixer, combine sugar, lemon juice-milk mixture, and egg. Blend together and then add lemon zest and lemon extract. Blend until smooth. Combine ground pistachios with 1 tablespoon of flour. Fold this mixture into the batter. The flour helps the pistachios to stay suspended throughout the batter. Bake for 15 minutes or until a toothpick inserted into the center comes out clean. Remove the muffins from the muffin pan and let them cool on a wire rack. Combine the glaze ingredients together. The consistency should resemble maple syrup. If it’s too thick to drizzle add more milk. If it’s too thin add powdered sugar. Lightly shake a fork dipped in the glaze over the top of the muffins. Store muffins in an airtight container. They may also be frozen. The flour in the pistachios will keep it suspended in the batter. Lemon just screams Spring to me. The addition of pistachios to these muffins just makes them that much better. My family is going to love these. Thank you, Jennifer! This one has really become one of our favorites! Nothing beats the smell of homemade muffins…any day, any season! It’s still cold here and I know everyone will love these straight from the oven. With the vibrant lemon taste I will make these all year round. How simple and delish! Girl, you are speakin my language with these! I’ll take a lemon muffin over chocolate any day of the week. Then you went and added pistachio. An must make recipe! Can’t wait to make these. Thank you Trish! I’m an equal opportunity muffin lover. Lemon is amazing but I can’t turn down a chocolate one either. Spring is here but the weather is still terrible. We may get one sunshiny day and the rest of the days are rainy and cold. Sometimes snow. Now the idea of lemon and pistachio has me seeing some bright warm lights – sunshine. I do love anything with lemon and pistachios are my favorite nuts. Your explanation of cupcakes and muffins is right on the mark. Thank you Marisa! I guess when it gets to hot we’ll be whining too LOL! Pistachios and lemon! What a great combination! I tend to use pistachios more often in savoury dishes, but I love them in all sorts of recipes. I’m totally with you when it comes to cake/muffin mix too. I call them ‘manufactured convenience’ – they give you the impression that you’re saving time, but when you factor in having to go out and buy them, you’re really not doing yourself any favours (plus I just think scratch tastes better). Once you try a good scratch recipe you realize that you’re not limited by box mixes, and that you can make any kind of cake/muffin base any time as long as you’ve got a well-stocked pantry. And hey, that’s my kind of power. Haha. I hope your winter woes pass soon enough – but if you keep turning out awesome recipes like this as a result, then it’s certainly not the worst thing in the world. Cheers. Ha! I like your superpower reference! I should be stocked for a month but I still find myself running to the store a couple of times a week. Thank you for stopping by Sean! 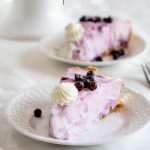 While we’ve had a fairly mild winter here (nothing like the weekly blizzards we got a few years back), I’m still all about lemony spring recipes! There is nothing like a lemon muffin to wake up the taste buds as I watch the crocuses wake up too. And I love the addition of the pistachios. I don’t bake with them enough and this was a great place to start. Thank you, Annemarie! Our winter started off mild but sure made up for it in a short period! Lemon puts me in a happy mood too! My mom just gave me a bunch of lemons from her tree, so I used fresh juice instead of the extract. These muffins are a keeper and I wll make again! Oh, I wish I had access to just picking them from the tree! That would be amazing! Oh my goodness! Seven weeks of snow sounds awful! We had what seemed like a lifetime of rain last year but cannot imagine what that much snow would be like. It certainly would call for a lot of baking to keep the cabin fever at bay! Thank you, Charity! I think we may be beating Seattle for the gloomiest year ever! I never used to use pistachios in anything. I feel like I wasted so many good years!! I LOVE baking with them, and I have been putting them in everything!! The addition to the lemon muffins is brilliant! Thank you! We didn’t grow up eating pistachios and I don’t even know if we had access to them. It was always walnuts! 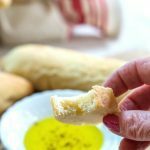 Jeff is a huge fan of pistachios so when I read this recipe I knew he would love them! A lovely texture and the nuts were so so good in them! I used a little more drizzle on mine, but other than that followed your recipe to a perfect delicious muffin! Thank you! John loved this one and may have just dipped his muffin in the glaze LOL! Made these this morning, and they were a hit with the family! So easy, and super tasty. It’s rainy and gloomy today where I live, and I was just thinking that I should bake something! 🙂 These muffins seem like just the perfect thing to drive away the winter/early spring blues; I love the combination of lemon and pistachio, and they are so easy to make. Thank you, Daniela! Gloomy here forever too! You’ve combined two of my favorite flavors pistachio and lemon! These muffins look so savory and delicious I can’t wait to give them a try! Thanks, Deb! We really loved them too! Lemon is my FAVORITE!!!! These look incredible! Thank you! We loved them too! Thanks Lynn! I’d love to figure that one out too! I love the combination of flavors! Lemon and pistachio sound so perfect together! These muffins look great! 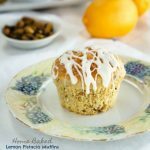 I love both lemons and pistachios, but never thought of combining them together, the muffins look moist and enticing, on my to do list! Thank you, Hadia! I really enjoyed this combination too! Oh, yes, I will be making these, Julie! I love lemon. I love pistachios. And, this is a perfect muffin for happiness! Thank you, Ally! Anything lemon here too! I could eat one of those muffins any time of the day. Thank you Christine! I agree! Spring is FINALLY here…and means LEMON desserts and goodies. I would love one of these to start my day. I would love one of these with my afternoon latte. I would love to serve these on the weekend brunch. By now, I think you know how much I love lemons. Thank you, Gloria! An afternoon latte with this muffin would be like a vacation at home!